We had a foot of snow one week before Christmas. The bulk of it was still here on Christmas Eve, but it all began to melt away in the rain on Christmas day. Now that it's gone, I'm still thinking of snow. Here are two terrific nonfiction reads about it. 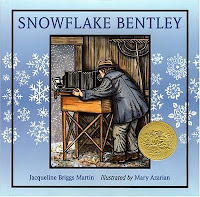 Snowflake Bentley (1998), written by Jacqueline Briggs Martin and illustrated by Mary Azarian - This Caldecott Medal winner tells the true story of Wilson Bentley, a farmer who spent the better part of his life studying and photographing snowflakes. It begins this way. Willie's story is told from his childhood through his death. Accompanying the biography are a series of sidebars that contain additional facts about Bentley. 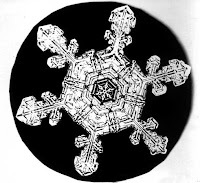 The last page of the book contains a photo of Bentley at his camera (the same one at the top of the Wilson Snowflake Bentley home page), a quote about his love for photography, and three of his renowned snowflake images. This is the story of a remarkable man who pushed the limits of science and technology to create groundbreaking images of snowflakes. If the book inspires an interest in further study, you can view a number of his amazing photographs at The Bentley Snow Crystal Collection. 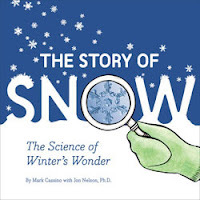 The Story of Snow: The Science of Winter's Wonder (2009), written by Mark Cassino with Jon Nelse, Ph.D. and illustrated by Nora Aoyagi - A visually appealing and highly informational book, readers learn that snow begins with a speck and then follow along as that speck becomes a snow crystal. Photos of snow crystals are included with a comparison of the enlarged images to a snow crystal of actual size. The shapes of snow crystals are examined (stars, plates, columns), as is their relationship to the number six. There is much to learn and wonder about here. The book ends with a guide for catching snow crystals. Teachers will find the teacher's guide for this book particularly helpful. This post was written for Nonfiction Monday. Hosting this week is Diane Chen at Practically Paradise. Do take some time to check out all the great posts highlighting nonfiction this week. Just before Christmas I read Snowflake Bently to my daughter's first grade class, we brought along his book Snow Crystals. Even for kids who see a lot of snow, it was fascinating. I love Snowflake Bentley--good pick! I love The Story of Snow and so did the kids in the library. They were fascinated with the pictures and so was I! I loved this book. I blogged on it to kick off the New Year. I also mentioned Snowflake Bentley and I love The Snowy Day, too. Do You Read "Writers Read?"